At the time this dish was made, Tabriz was an important cultural centre with important craftsmen in every medium. It was strategically located at the gateway to the eastern trade routes from Turkey, with a flow of silk and other luxury goods. Although there is no documentary evidence of pottery production in Tabriz, the petrofabric of this dish and a group of other examples is comparable with analysis of the body of Tabriz tiles. The design on the back of the dish, a repeated leaf-like motif identified as the "weedback" pattern, appears to have been a specific workshop 'signature' or house-style linking a group of dishes loosely inspired by contemporary rather than 'antique' Chinese originals, aimed at less discriminating clientele. Dish, fritware, large with flat everted rim and narrow footring, painted in underglaze cobalt blue, the centre with an animal identified as a rabbit crouched beneath a tree and leafy plants, surrounded by a plain band and a border of honeycomb pattern derived from designs found on late fifteenth century Ming dynasty porcelain, formed by triple parallel lines centred with a triangle formed of three dots, while the flange features a series of tightly curled waves against a hatched background. The exterior is painted with loose leafy branches which identifies it as part of the so-called "Weedback" group. The rabbit or hare is a popular theme in ceramics especially during the Mongol period. 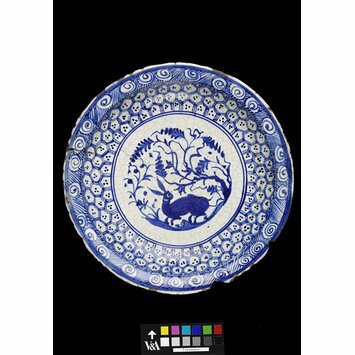 Dish, fritware, underglaze-painted in blue, depicting a rabbit in landscape, Iran, possibly Tabriz, 1500-1550. Acquired in Kubachi, Dagestan (North Caucasus). Y. Crowe, Persia and China: Safavid Blue and White Ceramics in the Victoria and Albert Museum 1501-1738, Thames & Hudson, Geneva, Switzerland and London, 2002, p. 51. Lisa Golombek, Robert B. Mason, Gauvin A. Bailey, Tamerlane's tableware : a new approach to the chinoiserie ceramics of fifteenth- and sixteenth-century Iran, Mazda Publishers in association with Royal Ontario Museum, Costa Mesa, California, 1996, p.153. Marina Whitman, Persian Blue-and-White Ceramics: Cycles of Chinoiserie, University Microfilms International, Ann Arbour, Michigan, 1978, fig. 62. Arthur Lane, Later Islamic Pottery, London: Faber and Faber, 1957. 133p., ill. Pages 34, 36, 79, 93, plate 21B. Arthur Lane, 'The So-Called 'Kubachi' Wares of Persia', The Burlington Magazine vol. 75 (October 1939) pp. 156-163, pl. I.G. Brought from Kubachi in Daghestan (Caucasus).